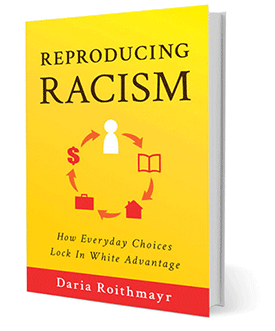 Legal scholar Daria Roithmayr provocatively argues that racial inequality lives on because white advantage functions as a powerful self-reinforcing monopoly, reproducing itself automatically from generation to generation even in the absence of intentional discrimination. Drawing on work in antitrust law and a range of other disciplines, Roithmayr brilliantly compares the dynamics of white advantage to the unfair tactics of giants like AT&T and Microsoft. With penetrating insight, Roithmayr locates the engine of white monopoly in positive feedback loops that connect the dramatic disparity of Jim Crow to modern racial gaps in jobs, housing and education. "Roithmayr gives us profoundly important leverage on the 'locked-in' nature of American racial inequality. Her accessible and ably documented book shows how the historic works of 'racial cartels' like the Jim Crow system gave white Americans a now self-reinforcing and troubling permanent economic advantage in life. Critically, she shows how today's ostensibly race-neutral processes of family inheritance, social network ties, and institutional practices and meritocratic standards make racial inequality automatic. This book is a necessary antidote to all the nonsense talk of post-racialism." "Tremendously important... Roithmayr's sobering read on our inequality gap - its roots and its linger effects - should be required reading for anyone who believes in simple causation or easy fixes for the equality gap. This is a clear-eyed and often brutal look at whether America is indeed 'post-racial' and what we must demand of ourselves to get there." "Offers an explanation of the operation of race that transcends and incorporates the best extant scholarship on the issue." "The most persuasive argument I've yet seen for why racial inequality persists and what we can do about it. Well written, well researched, and well worth reading." "This book, which builds on an already impressive body of work by Roithmayr, deserves to be widely read. It is methodologically serious and theoretically rigorous."